We root for our team to do well. We root for our team to create and leave lasting memories, from a dazzling defensive play in a Spring Training game to the final World Series-clinching out. With every pitch in a baseball game, we’re seeking a connection to something special, a fastball right to our nervous system. In a world that can bring frustrations on a daily basis, we root as an investment toward bragging rights, which are not as mundane as that expression makes them sound. If our team succeeds, if our guys succeed, that’s something we can feel good about today, maybe tomorrow, maybe forever. The pinnacle of what we can root for is Jackie Robinson. Robinson is a seminal figure – a great player whose importance transcended his team, transcended his sport, transcended all sports. We don’t do myths anymore the way the Greeks did – too much reality confronts us in the modern age. But Robinson’s story, born in the 20th century and passed on with emphasis into the 21st, is as legendary as any to come from the sports world. And Robinson was a Dodger. If you’re a Dodger fan, his fable belongs to you. There’s really no greater story in sports to share in. For many, particularly in 1947 when he made his major-league debut, Robinson was a reason to become a Dodger fan. For those who were born or made Dodger fans independent of Robinson, he is the reward for years of suffering and the epitome of years of success. Robinson’s story, of course, is only pretty when spied from certain directions, focusing from the angle of what he achieved, and what that achievement represented, and the beauty and grace and power he displayed along the way. From the reverse viewpoint, the ugliness of what he endured, symbolizing the most reprehensible vein of a culture, is sickening. Before Robinson even became a major leaguer, he was the defendant in a court martial over his Rosa Parks-like defiance of orders to sit in the back of an Army bus. His promotion to the Dodgers before the ‘47 season was predicated on his willingness to walk painstakingly along the high road when all others around him were zooming heedlessly on the low. 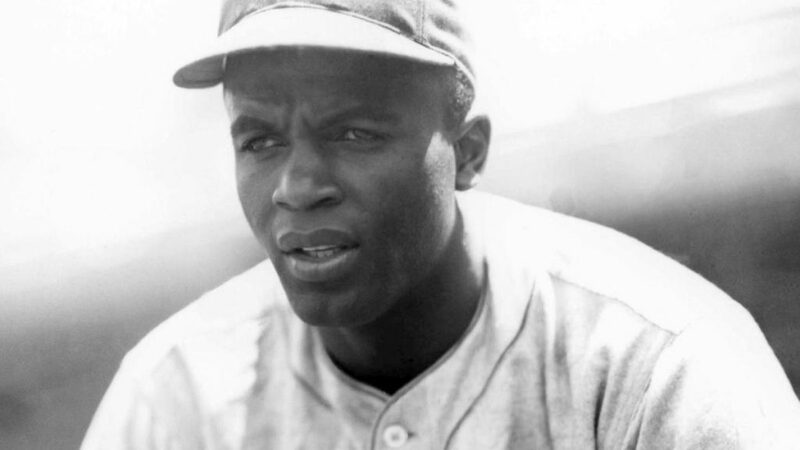 Even after he gained relative acceptance, even after he secured his place in the major leagues and the history books, even after he could start to talk back with honesty instead of politeness, racial indignities abounded around him. Robinson’s ascendance was a blow against discrimination, but far from the final one. He still played ball in a world more successful at achieving equality on paper than in practice. It’s important for us to remember, decades later, not to use our affinity for Robinson as cover for society’s remaining inadequacies. Does that mean we can’t celebrate him? Hardly. For Dodger fans, there isn’t a greater piece of franchise history to rejoice in – and heaven forbid we confine our veneration of Robinson to what he symbolizes. The guy was a ballplayer. Playing nearly every position on the field over 10 seasons, Robinson had an on-base percentage of .409 and slugging percentage of .474 (132+ OPS, .310 EQA). He was an indispensible contributor to the Dodgers’ most glorious days in Brooklyn – six pennants and the franchise’s first World Series victory. It also helps to know that some of Robinson’s moments on field were better than others, that he didn’t play with a impenetrable aura of invincibility. He rode the bench for no less an event than Game 7 of the 1955 World Series. He was human off the field, and he was human as well on it. In the end, Robinson’s story might just be the greatest story in the game. His highlight reel – from steals of home to knocks against racism – is unmatched. In a world that’s all too real, Robinson encompasses everything there is to cheer for. If you’re a fan of another team and you hate the Dodgers, unless you have no dignity at all, your hate stops at Robinson’s feet. If your love of the Dodgers guides you home, Robinson is your North Star.